I have a few friends who’ll go drinking at T’s and, at some point during the course of the evening, decide they should get tattoos. Fortunately or unfortunately (depending on your perspective), there’s a tattoo shop just a couple doors down from the bar, which allows them to follow through on their plans immediately—and they do. Surprisingly enough, no one has made any really regrettable decisions so far. In fact, my friend Sarah prefers the half-dozen tattoos she’s gotten at Head 2 Toe Tattoos after having several drinks in the neighborhood to what she calls the “redneck tattoos” she got years ago, even though the latter (which include a howling wolf image and kanji characters) were planned out ahead of time. 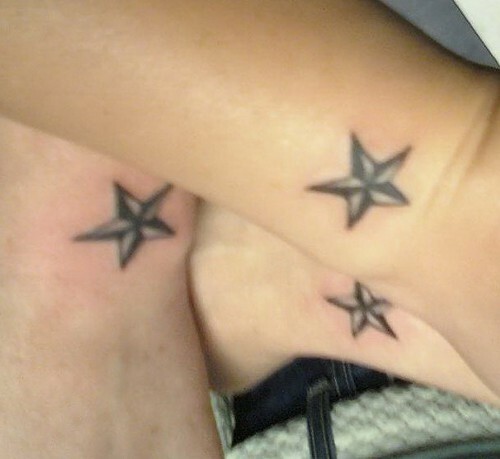 The first time these friends took a post-T’s trip to the tattoo parlor was a few years ago, when three of them had nautical stars tattooed on their wrists in homage to the ones that lesbians in the 1940s and '50s would get; at the time, according to the book Boots of Leather, Slippers of Gold: The History of a Lesbian Community, they served as a form of identification that was easy to cover with a watch during the day. I was curious about what other kinds of tattoos gay people have historically gotten, so I did a little research online and found . . . not much, aside from a fascinating Autostraddle piece on gay symbols (including a brief history of the rainbow flag). Maybe that's because tattoos tend to be personal—no one wants the same tattoo as everyone else in the world, or even the gay community. So people come up with designs that are specific to them (or their group of friends). The most recent tattoos for the group that got the stars on their wrists? "306.766," the Dewey decimal number for homosexuality. It works for them, but I can't imagine it becoming a trend. This weekend I was telling a friend about how little information I'd found regarding gay tattoos when she pulled out her copy of Secret Historian: The Life and Times of Samuel Steward, Professor, Tattoo Artist, and Sexual Renegade, by Justin Spring, and handed it over. Steward, who helped Alfred Kinsey with his research on sexuality by taking detailed notes on his many sexual encounters, also had a tattoo parlor on South State Street in the 1950s and '60s under the name Phil Sparrow. I've barely scratched the surface of the book so far, but I did take a look at a couple of the chapters that deal with Steward's interest in tattooing. According to Spring, Steward decided after his first few tattoos to allow himself just one new one for each hundred sexual contacts, in order to help himself resist getting too many tattoos. In the chapter "A Kind of Obscene Diary, Really," Steward writes in his journal that he wants a rose in the center of his chest, and doesn't think he'll be able to wait until he's reached 600 contacts (in another chapter, a journal excerpt reveals that by the age of 45, he's had 2,200 sexual contacts). Steward wrote to a friend that leaving his position as a professor and opening a tattoo parlor was his "ultimathule, my dream of nirvana. I shall be called 'Professor Sparrow' and be the Mr. Chips of the tattoo world. Ave atque vale, for I am about to leave the world we know! (Blow jobs furnished free.)"